Friction Quartet premieres new works by Grammy-nominated composer, pianist, and producer Pascal Le Boeuf and beloved local composer Danny Clay during this exciting double-bill event. The evening includes Le Boeuf’s latest large-scale work “Ritual Being,” performed by a hybrid ensemble comprised of Friction Quartet and his own jazz ensemble. Made possible by support from Chamber Music America’s 2015 New Jazz Works program funded through the generosity of the Doris Duke Charitable Foundation, “Ritual Being” explores the differential manifestation of human behavior patterns at micro (individual) and macro (en masse) scales, and how these “rituals” can be either propitious or disastrous. 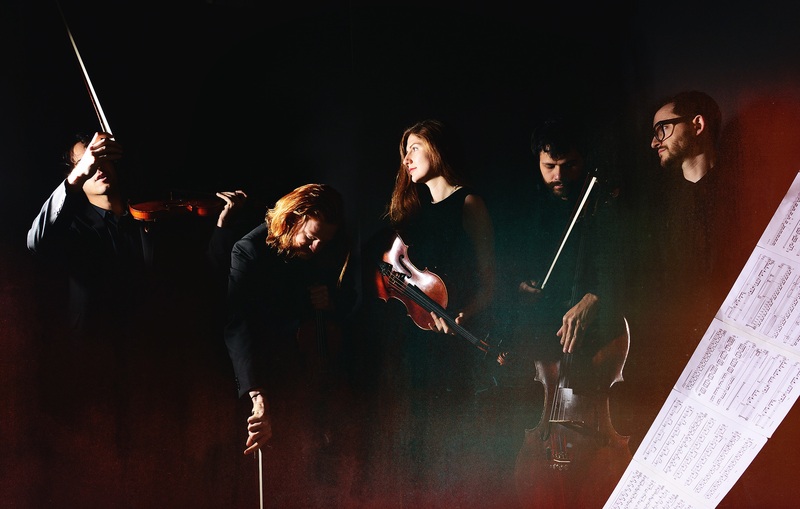 Friction Quartet will also premiere “CounterPaint: The Art of the Fugue,” an interdisciplinary collaborative work that incorporates elements of classical music, collaborative painting, graphic notation, and improvisation to document a community of like-minded musicians through the lens of a party game. By combining concepts from Danny Clay’s “27 Overtures” with Pascal Le Boeuf’s collaborative approach to painting with groups of musicians, Clay and Le Boeuf engaged 34 composers and musicians to co-author a piece by approaching 27 canvases. This occasion will mark the world premiere screening and release of the “CounterPaint” music video (by Four/Ten Media), which showcases the painting process and Friction’s studio interpretations of the work. Stick around for a drink with the artists and get an up-close look at the extensive collection of score- paintings! – CounterPaint: The Art of the Fugue – by Pascal Le Boeuf, Danny Clay, Friction Quartet (Otis Harriel, Kevin Rogers, Taija Warbelow, Doug Machiz), Daniel Silliman, Emma O’Halloran, Gemma Peacocke, Steve Mackey, Matt McBane, So Percussion (Josh Quillen, Adam Sliwinski, Jason Treuting, and Eric Cha- Beach), Ninfea P. Cruttwell-Reade, Bora Yoon, Connor Elias Way, Tom Morrison, Natalie Dietterich, Anna Pidgorna, Juri Seo, Florent Ghys, Tamika Gorski, Molly Herron, Jenny Beck, Alyssa Weinberg, Anna Meadors, Chris Douthitt, Elliot Cole, Katelyn Halpern, Mike Mulshine, Kevin Eikenberg, and Annika Socolofsky.